Folk quartet with just one album to their name, released on the label usually associated with the Wolfe Tones. This album includes ballads, electric folk, folk rock and even, despite the drummerless lineup, celtic rock -- a session drummer was used in the studio. 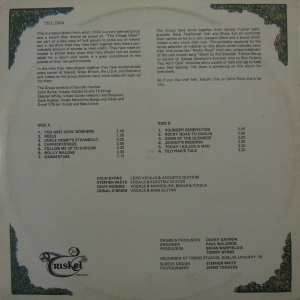 While much of it is not too original for 1978, with too many songs and arrangements copied from predecessors, it's certainly well executed, and several tracks would be of interest to Horslips fans. There's also a Bob Dylan cover and a version of "Summertime", showing that they weren't simply Wolfe Tones copyists. Even so it hasn't attracted much attention from collectors and is inexpensive. 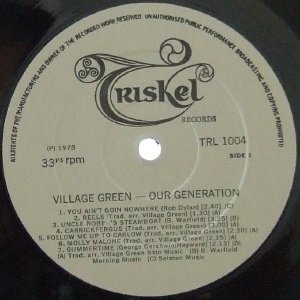 Recorded at Trend Studios, Dublin, January 1978. "This is a debut album from what I think is a very talented group and a record they should be proud of. 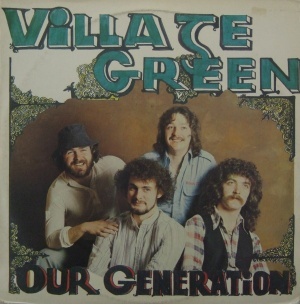 The Village Green are part of a new wave of folk groups to come out of Ireland and in the short time they have been together they have a considerable amount of success to their credit. They have made an impact is almost every place they have played and are always asked for a return visit wich is a great compliment to the success of their live performances. "In the time they have played together they have toured almost every corner of Ireland, Great Britain, the U.S.A. and Germany and indeed as the group matures manu more roads will open up for them. The group have come togehter from various musical backgrounds. Rock, Traditional Irish and Blues, but all combined their talents arrive at a very pleasant blend and a sound which indeed is very much of their own. This probably accounts for the varied selection of material on this album which includes many trad. Irish tunes like Rocky Road, their very unique treatment of the well known song Down by the Glenside, [from] Follow Me Up To Carlow to George Gershwin's Summer Time to Bob Dylan's You Ain't Goin' Nowhere and a couple of reels and jigs to keep your feet tapping. Yes there is something on this album for everybody. "So if you like Irish folk, Electric folk or Celtic Rock this is for you. Notes: Recorded at Trend Studios Dublin, January 1978. Engineered by Paul Waldron, produced by Brian Warfield & Tommy Byrne. With drums & percussion by Dave Gaynor (then ex Angel, Rob Strong Band, Skid Row and Spud).